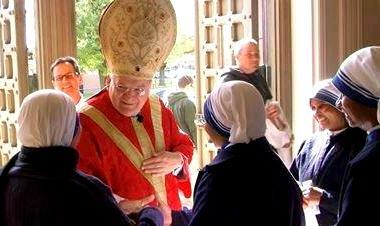 His Eminence Raymond L. Cardinal Burke with Missionaries of Charity. The Cœtus Internationalis Summorum Pontificum is happy to announce that His Eminence Raymond Leo Cardinal Burke, Prefect of the Supreme Tribunal of the Apostolic Signatura, will celebrate the Solemn Pontifical High Mass according to the Extraordinary Form of the Roman Rite, on Saturday, October 25, in Saint Peter’s Basilica, at 12:00 Noon, on the occasion of the Third Summorum Pontificum Pilgrimage to Rome. The CISP would like to thank His Eminence Angelo Cardinal Comastri, Archpriest of Saint Peter’s Basilica, for responding so quickly to our request and making possible the celebration of the Holy Mass, the culmination of our pilgrimage ad Petri Sedem. We can therefore begin to organize the pilgrimage, already now, eight months in advance, making it easier for pilgrims from Europe and from abroad to plan to participate in the pilgrimage to Rome. Thanks to the Motu Proprio Summorum Pontificum of H.H. Pope Benedict XVI of 7 July 2007, the riches of the Extraordinary Form are becoming more and more accessible to the Universal Church (Instruction Universæ Ecclesiæ, 30 April 2011), and people from all parts of the world are able to gather in pilgrimage for solemn prayer and for offering a witness to the faith. We remind all that the Pilgrimage will begin on Thursday, October 23, and will conclude on the Feast of Our Lord Jesus Christ, King, on Sunday October 26, 2014. This entry was posted in #sumpont2014 and tagged 2014, cardinal Burke, pilgrimage, Rome, Vatican. Bookmark the permalink.